Due to the special nutritional demands of growth, pregnancy, or lactation, Nutra-Nuggets Puppy is precisely formulated to help ensure your puppy or pregnant/nursing adult dog receives the proper amount of key nutrients to help enhance growth and help promote health. 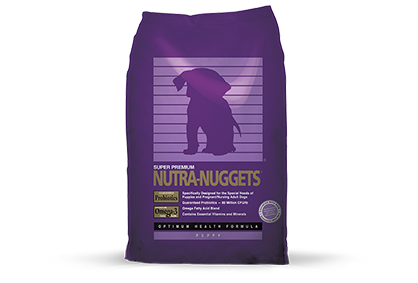 Nutra-Nuggets Puppy Formula is formulated to meet the nutritional levels established by the AAFCO Dog Food Nutrient Profiles for All Life Stages including growth of large size dogs (70 lbs. or more as an adult).